Getting injured in a Toronto car accident as a result of the carelessness and negligence of another driver is devastating. Finding out later that the at fault drive who caused the car accident was driving without insurance is even more devastating. Driving without insurance is illegal and is punishable at law. But you won’t see judges or police put somebody in jail for a prolonged period of time for the offence of simply driving without insurance. Perhaps if they were driving drunk and caused bodily harm or death the at fault driver will have to do some jail time. But simply driving without insurance won’t garner a jail sentence. But where do you turn if you’ve been injured by a driver who caused a car accident while driving without car insurance? Who can you sue? Who will you get your accident benefits from? The lawyers of Goldfinger Injury Lawyers have been helping accident victims and their loved ones recover millions and millions of dollars arising from car accidents involving uninsured drivers. In Toronto, and in the rest of Ontario, we are fortunate of have an insurance scheme which doesn’t shut out accident victims if they’ve suffered injury on account of the negligence or carelessness of an uninsured driver. It wouldn’t seem right if you were driving with insurance, and the other driver was uninsured, and you didn’t have any recourse to claim compensation for your injuries, pain and suffering. Ontario’s Insurance Act has a complicated set of priority rules in place to determine which insurance company is responsible to indemnify the accident victim in uninsured car accident claims. The streets of Toronto, London and Peterborough have seen plenty of these sort of cases. If the at fault driver did not have any form of car insurance, then you first need to look to determine if the owner of the car, or the owner of the household which possessed the car had any form of car insurance. If so, then that car insurance company will be responsible for coverage. If there was still no insurance to be found, then car accident law requires that we look to see if the accident victim had any form of car insurance at the time of the car accident. If the injured party had insurance, then their own car insurance company will be responsible to pay out of the claim. This means that the injured party will need to sue, or bring a claim against their own car insurance company. This might sound confusing to many accident victims, but it’s the way the law works. After all, this is why we have insurance in the first place. Uninsured driving accidents are very common on the other side of the border, particularly in impoverished areas where people can’t afford to pay for insurance. Drivers purchase insurance to protect themselves against the threat of being involved in a car accident against an insured driver who is really without assets to satisfy and sort of judgment. If both the negligent driver and the injured party don’t have car insurance, then it’s possible for the injured party to still recover compensation. Ontario’s provincial government has established a fund to indemnify innocent drivers in such claims. These claims are limited to $200,000, plus costs and interest. 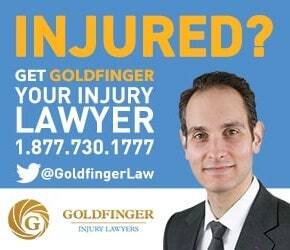 If you or a loved one has been victimized by an uninsured driver, let the lawyers of Goldfinger Injury Lawyers assist you. With offices in Toronto, London and Peterborough, we are able to meet with you where it’s most convenient. We will even come to your home or hospital to visit you if necessary. What’s the Deal With Texting or Using a Cell Phone While Driving? Why do I Have to Sue my Own Car Insurance Company After a Car Accident? Do I Really Need Winter Tires for my Car In Order to Avoid a Car Accident In Toronto?